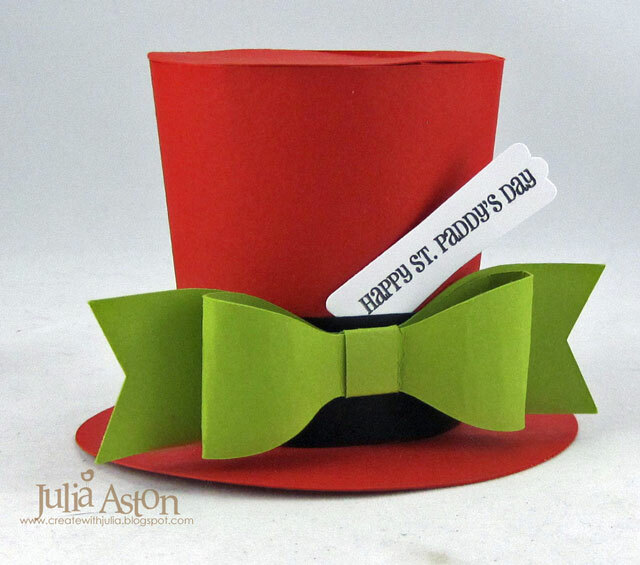 Just a quick post to share a card I made for this weeks' CAS(E) this sketch challenge and a little treat 'hat' box.. I used a strip of beautiful digital paper called Folk Art 'Clean' from Waltzingmouse along with a lacey punched strip beneath it (Martha Stewart. 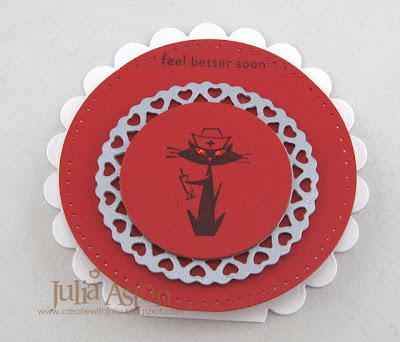 This lovely get well sentiment is from Vintage Garden Seed Packet from WMS. 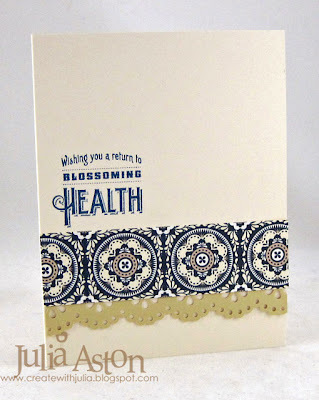 The card base is vintage cream and I used a Memento Nautical Blue ink. This is a great CAS sketch - this would be lovely as a sympathy card with the appropriate sentiment or a Happy Birthday - don't you think?! Very versatile! 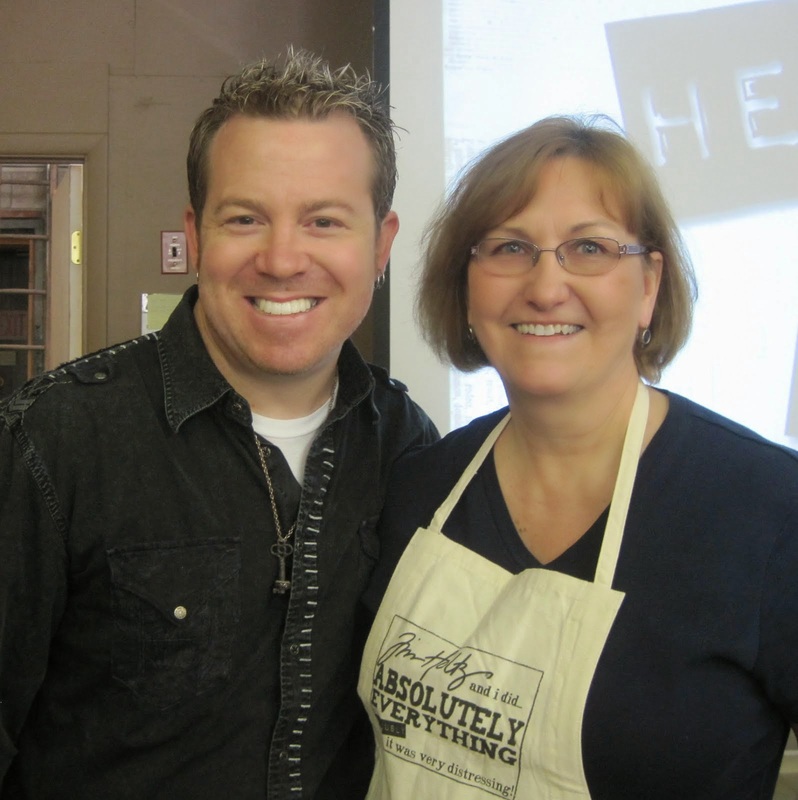 Kent and I are off to visit my friend Anne, her husband and mother who now lives with them. I met Anne (jdmommy) through Split Coast and it turns out she only lives about 40 minutes away, so we get together now and then. Anne recently had surgery on her thumb so we are going to have some pizza with them and to hopefully help take her mind off her hand for a few hours! 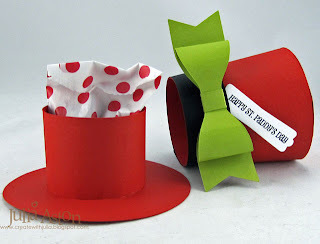 I even packaged the little treats inside the hat in a red polka dot bag! She'll get a kick out of that I think! I'm sharing a card today that I made for the Inspiration Challenge over on Split Coast. The inspiration site this week was an Etsy shop called Decoylab - they make fun clocks and I was inspired by this one - a vintage phone clock. It reminded me I had a Movers and Shapers phone die that I bought almost a year ago and hadn't even tried out yet! My papers are from Library Ledger from PTI and my sentiment is from The Cat's Pajamas - Warm Fuzzies Set. 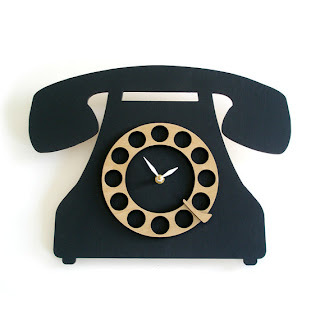 The phone is popped up on foam tape. I sponged the edges of the papers with Ranger Distress Weathered Wood and distressed the edges. Just to let you know - Claire is having Sneak Peeks of her March release over on the WMS blog if you'd like to take a look! Mother - I Ruff You! 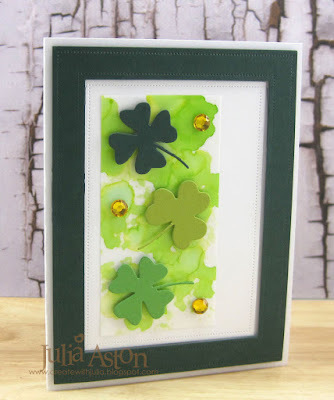 A fun free 4 all challenge over on Split Coast last Friday - to cut out of the box and emboss. I followed the technique instructions in the Split Coast forum. I used my brandy new Labels 10 Nestability for my framing. 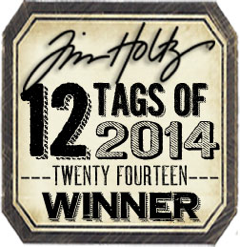 I also embossed the label after cutting it to meet the challenge requirements! 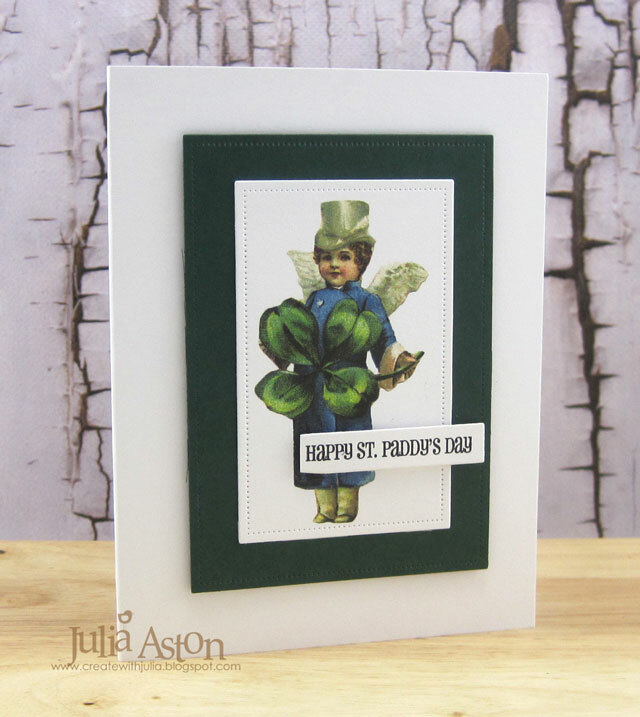 This beautiful heart with the Celtic Lunette design, matching digitial patterned paper and the sentiment are all from Waltzingmouse Stamps My card today is very clean and simple. I popped up the label on foam dimensionals and then just added 3 sticky gems to the lower corner! I don't have a lot of time to stamp after work so I try to get lots of challenges into a card if I can - so today I was able to hit 4 challenges! 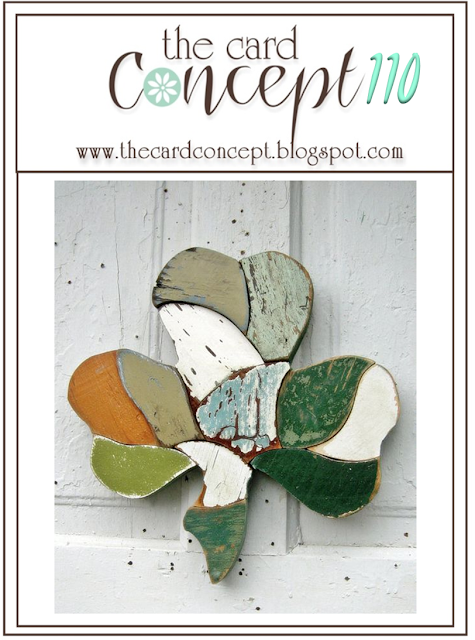 I used the Split Coast color challenge Apricot, sage, grey - Mercy's Tuesday Sketch, and the The Cat's Pajamas Tuesday challenge was to use cork. And I'm bringing my little flying doggie (Angel Yappy) to da Mudder's Teaparty - which is at the Kentucky Derby this week - we have to ride something there to participate in the race because all of the horses went on strike - Yikes I hope flying counts!?!?! LOL!! 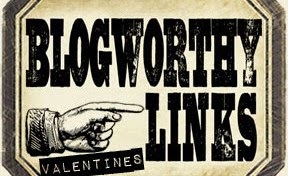 Read all about the Split CoastTuesday Teaparty craziness here. I seem to be chronically late for the teaparty's lately! But here I am none-the-less and the parties are that kind that just go on and on! LOL!! This week we had to bring some color to Abner the Abdominable Snowman because he is sick to death of WHITE! 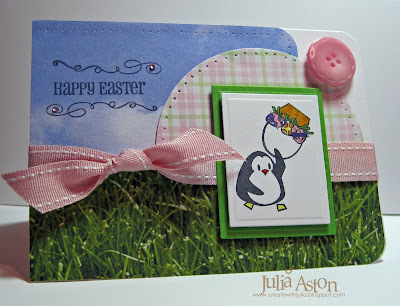 So I'm bringing along some green grass and blue sky - as well as this little penquin guy with his gravity defying Easter Basket. I figured Abner would feel at home with this ice loving creature and wouldn't feel so nervous about all the new colors he was seeing! My card is also for Fran's Doubledog Dare Challenge to us this week - to make a 1-2-3 card - I used one ribbon, two little gems, and three designer papers! 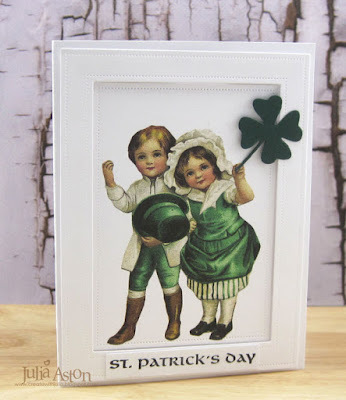 Reminder: Claire is releasing 3 lovely new stamp sets on Monday - see some sneak peeks at Claire's, Anya's and Lynn's today - they'll make you want these new stamps - ya - they will!! 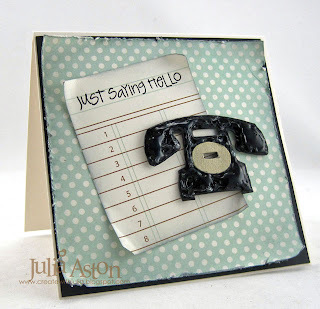 Happy Saturday everyone - are you stampin'??? More than Just a St. Paddy's Day Card! I guess I missed the BIG Mardis Gras Celebration for the Mudder's Teapot Challenge - just couldn't get to stamping yesterday - but if I know the Teaparty gals - there's still a lot of partying going on down there - so PJ Bear is bringing down the green because we heard that there's already plenty of purple and gold there! 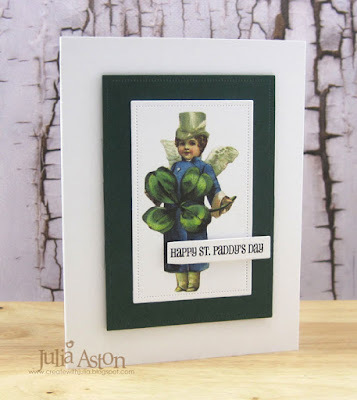 AND Joanne's Doubledog Dare challenge this week was to make a St. Patrick's Day card so here you go! 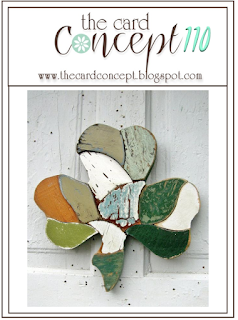 My sketch is Mercy's Tuesday sketch and the colors are the TCP Tuesday Challenge to use olive, light blue and Ivory! With less stamping time you have to pack them all in right?!?!? 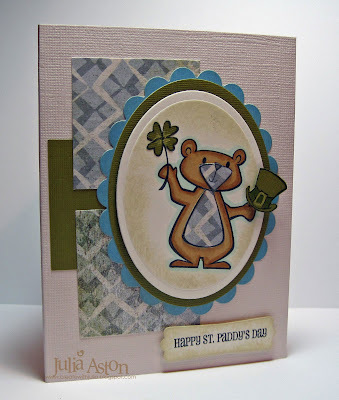 Every Tuesday one of the Design Team of TCP (The Cat's Pajamas) issues a challenge and this week Amy Rohl's challenge was to use paper piecing on your card. I don't have my newly won A Beary Good Year set yet (see yesterday's post!) 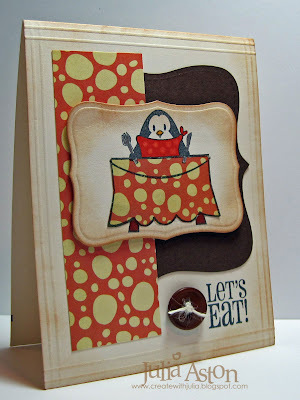 - so I used this cute dining penquin from the Gobble it Up set, paperpiecing the table cloth. I used Labels Eight Nestabilities to frame him and my Top Note by SU (cut in half) for the background piece. The designer paper is Cosmo Cricket/Earth Notes. I used my Scor Pal to make a double frame around the edge and sponged it with Ranger Tea Dye Distress ink. Then I just stamped my sentiment and added the button knotted with twine! 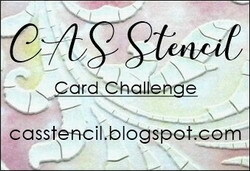 Check out the challenge and load up yours here before the end of Feb. Maybe you'll be chosen the Swanky Stamper of the month - uh -- oh no - I'm going to be chosen Swanky Stamper of the month - forget I mentioned the contest ! LOL!!! 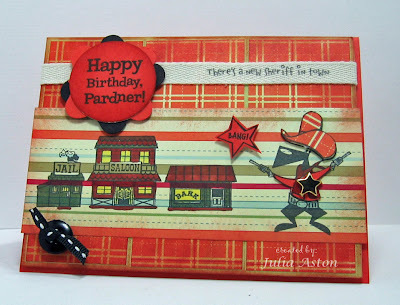 I love this sheriff set and the fun Cosmo Cricket Lil Man designer paper. I'm seeing orange everywhere - a color I don't usually use - but it's growing on me the more I see it! I stamped the images directly on the designer paper - then colored in some of the town building parts so they stood out. I paper pieced the hat and shirt of the sheriff, putting the hat up on foam dimensionals. I added the big star brad to his shirt and colored his guns and belt with my Spica silver pen. IRL they are shimmery! I used the Swirly Punch by Stampin Up to punch a black and orange piece - then layered them under the circle that I stamped the sentiment on. 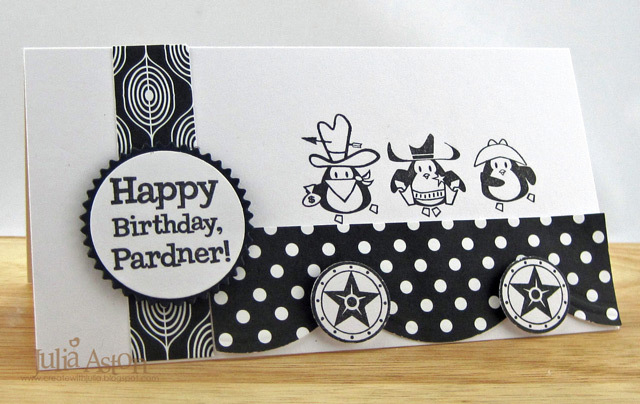 I added the button because I needed that third thing to draw your eye around the card! 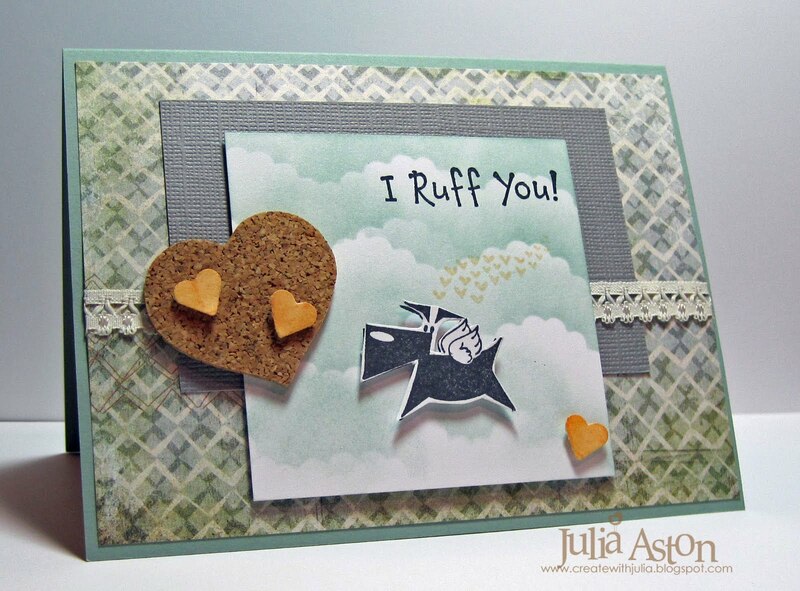 I figured a black button is ok on a boys card! The 'bang' star is up on foam dimensionals. I stamped "there's a new sheriff in town' directly onto the twill. 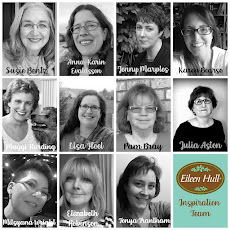 Don't forget to check back tomorrow to see my contribution to the World Record Inspirational Unity Blog hop! It's scheduled to go off at 10 am I think! I'll have mine up early just in case!